The picturesque Darjeeling hills in West Bengal is gearing for a pitched battle between two Gorkhas in the Lok Sabha elections, as development and restoration of democracy top the poll planks, relegating the long-standing demand for a separate Gorkhaland to the background. For the first time in three decades, the call for a separate Gorkhaland state is not a poll issue in the hills, with parties, including the indigenous GJM and GNLF, stressing on minimum wages for tea workers, potable water, electricity, education and employment. The Darjeeling Lok Sabha constituency, which goes to polls on April 18, is set to witness a keenly-fought battle between the two warring factions of the Gorkha Janmukti Morcha (GJM) -- one led by its supremo Bimal Gurung and his one-time protege Binay Tamang. Gurung is supporting BJP’s Raju Singh Bisht, while Tamang is in favour of TMC’s Amar Singh Rai. The saffron party also has the support of another prominent hill party, the Gorkha National Liberation Front (GNLF). “The polls will establish who between Gurung and Tamang the supreme leader of the hills is. The people of the hills are with Gurung. Tamang has compromised with the TMC in order to serve his own vested interests,” Loksang Lama, the working president of the Bimal Gurung faction of the GJM, said. Lama’s view were echoed by leaders of the Tamang camp, who felt whoever loses will no longer be accepted as a leader of the Gorkhas. The ruling TMC in West Bengal is yet to win the Darjeeling seat even once since its inception in 1998, while the BJP has emerged victorious twice. “We are stressing on the overall development of the hills, which it has been deprived of for the last 10 years. Our agenda is development. The BJP MPs have done nothing for the people of the hills,” said Rai. The TMC is against the separate state of Gorkhaland. The BJP and Gurung’s faction of the GJM feels restoration of democracy, which has been “missing” following the 104-day long strike in the hills over the demand of Gorkhaland in 2017, is the most important aspect in the polls. “People here will vote for restoration of democracy in the hills. They haven’t forgotten the atrocities committed by the TMC during the agitation,” Bisht told PTI. He said a “permanent political solution” is the need of the hour in Darjeeling, but remained non-committal on the demand for a separate statehood. Darjeeling, dominated by the Gorkha community, besides the Lepchas, the Sherpas and the Bhutias, has a total of 16 candidates in fray, including TMC’s Rai, BJP’s Bisht, CPI(M)’s Saman Pathak and Congress’s Shankar Malakar. Apart from three hill assembly segments—Darjeeling, Kurseong and Kalimpong, which are held by the GJM—the constituency also includes four other assembly segments in the foothills and plains—Matigara-Naxalbari, Siliguri, Phansideoa and Chopra. Two are held by the Congress and one each by the CPI(M) and the TMC. The Darjeeling seat, located between the Indo-Bangla border and the Indo-Bhutan border with Sikkim as neighbour, is of immense strategic importance as the Siliguri Corridor is considered to be a lifeline or “chicken’s neck” to the entire north east. The constituency has a total of 15,98,863 voters out of which 8,06,298 are male and 7,92,543 female. Darjeeling was represented by BJP leaders Jaswant Singh and Surinder Singh Ahluwalia in Parliament in 2009 and 2014, respectively, with support of the GJM. In 2014, the BJP had won the seat by securing 42.73 per cent votes, whereas the TMC bagged 25.47 percent votes. The statehood demand and implementation of the sixth schedule of the Constitution had been major poll planks in the hills at various times, since the beginning of the protracted Gorkhaland movement in 1986. The BJP, which is eyeing a third term in the constituency, has made no mention of Gorkhaland in its manifesto. It has, however, promised Scheduled Tribe tags for 11 Gorka sub-communities. Meanwhile, CPI(M)’s Pathak hoped that people would vote for the party as both the TMC and the BJP “failed” the people of the constituency. 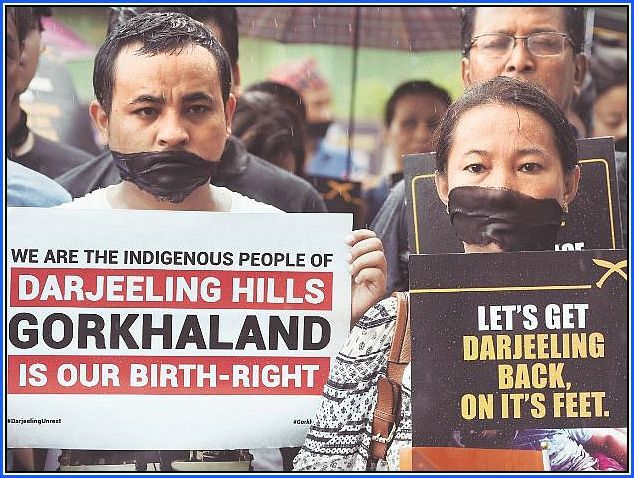 The picturesque Darjeeling hills in West Bengal is gearing for a pitched battle between two Gorkhas in the Lok Sabha elections, as development and restoration of democracy top the poll planks, relegating the long-standing demand for a separate Gorkhaland to the background.